I accidentally bought a few leeks at the supermarket the other day. Not like they jumped in my basket, onto the conveyor belt and into my bag unnoticed. I was picking up ingredients for a new scallop recipe, and thought it called for leeks, when truly, it was fennel. Oops! 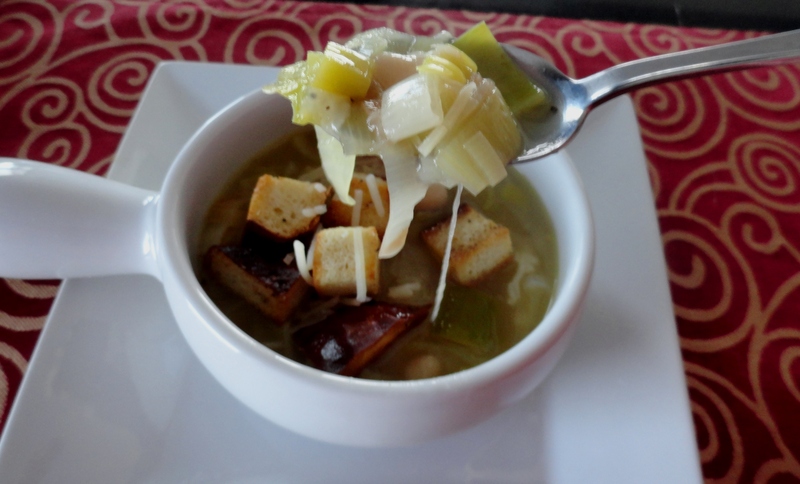 So, seeing as though I had these perfectly good leeks in my fridge, begging to be used, I decided to help them meet their destiny with a soup. While I was making this soup, I was thinking, this is very simple. As in, there isn’t much to it, I sure hope it tastes good. But don’t worry, it does. The practically melted leeks with a hint of thyme have a perfect savory-sweet pairing. 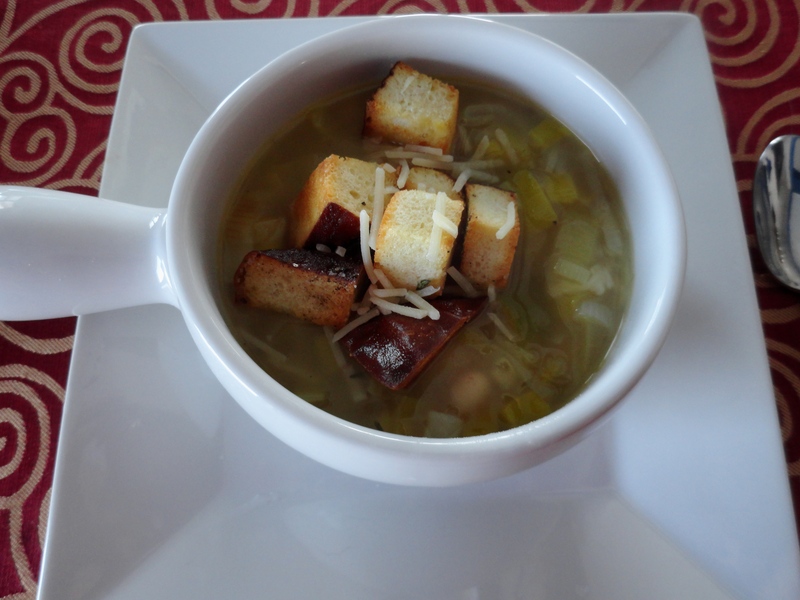 The beans give it a needed heft, and the croutons add a nice crisp. The recipe calls for fresh grated Parmigiano-Reggiano cheese, but I made mine without (except for garnishing in the picture). 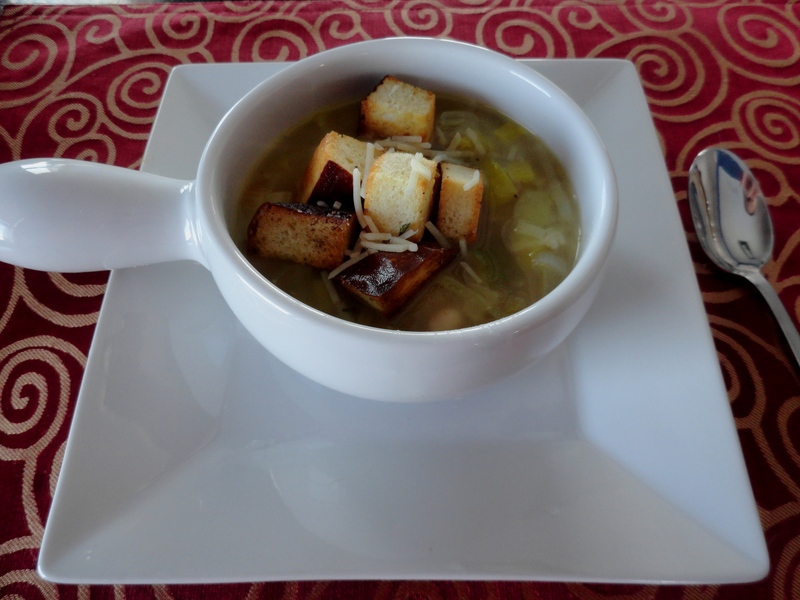 I also used pretzel bread to make the croutons, which tasted absolutely amazing. This soup comes together in less than 30 minutes, so it’s an easy weeknight meal, and is perfect warming agent during this polar vortex hulla-ballew. 1. Preheat oven to 350 degrees. On a foil lined baking sheet, toss bread crumbs with olive oil and season with salt and pepper. Bake until bread crumbs become golden brown and crisp. 2. In a large saucepan, melt butter. Add leeks and thyme and cook over moderate heat, stirring frequently, until leeks are tender, about 10 minutes. Add beans and chicken broth, cover and simmer until leeks are very tender, about 10 minutes more. Season to taste. Remove from heat, stir in Parmigiano-Reggiano if desired. Serve and top with croutons. 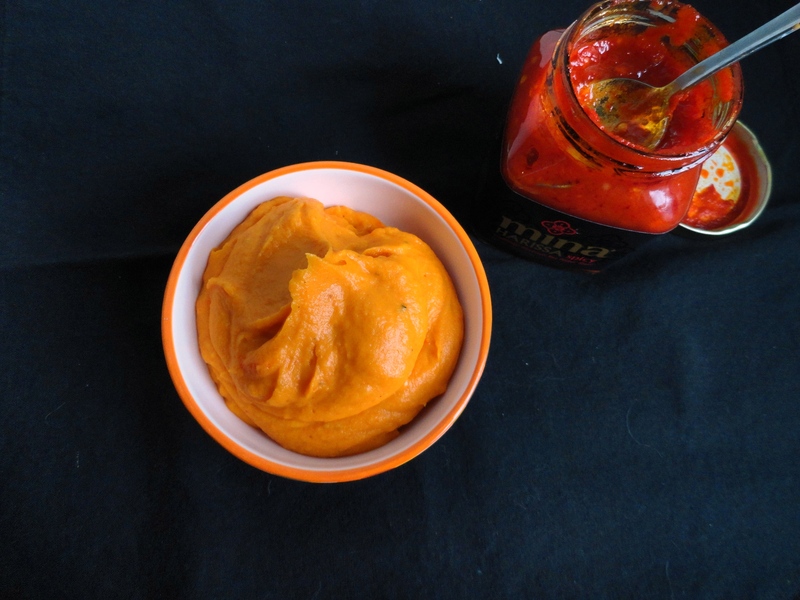 This is my third and final whipped sweet potato recipe of the week. And I have to say, I saved the best for last! These whipped sweet potatoes are the same as the original, with the addition of harissa. What’s harissa, you ask? Great question. 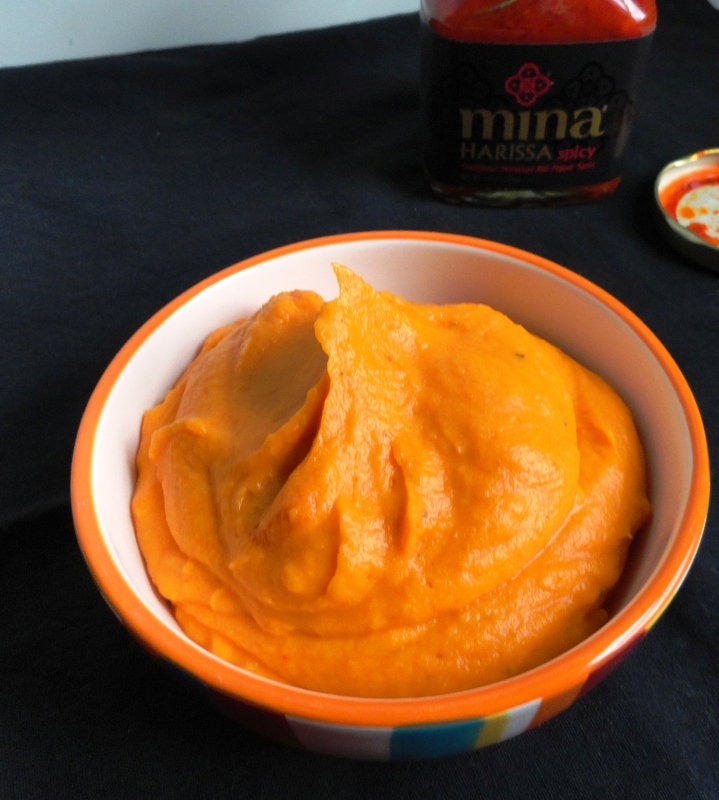 Harissa is a Tunisian hot chili sauce whose main ingredient is roasted red peppers, with Serrano peppers, and other hot peppers, depending on the region it’s from. With the addition of some herbs and spices, like garlic, caraway, coriander seed and chili powder, this seemingly simple sauce has a deep complex taste (Harissa can be found at Whole Foods and other specialty stores – don’t count on finding at your local grocer, I couldn’t). Paired with the sweetness from the potato, this is a match made in heaven. Give it a whirl for a new take on sweet potatoes! 1. Preheat oven to 400 degrees. Pierce sweet potato several times with a fork and bake on baking sheet for about one hour, until very tender. Let cool slightly. 2. Peel sweet potatoes, chop roughly and transfer to food processor. Add butter, sour cream and harissa and puree until smooth. Season with salt and pepper to taste and serve. I promise, this will be my last countdown post of the year (and probably for a while). But, as I mentioned yesterday, I am going to attempt to remake and retake pictures of my worst pictures of 2012. While these are not my only bad pictures, I chose them as my worst. It certainly doesn’t mean the recipe is bad, because in most cases, it’s awesome, but the pictures need some definite improvement. Look for updates in 2013! What were your favorite pictures this year? Cream Cheese and Jalapeno Burger: This made my list as well. The picture doesn’t come close to doing it justice; this was when I first started blogging, so my photography wasn’t as top-notch as it is now ;). Okay, so maybe there is still room for improvement, but I’ve definitely made some pretty good headway! 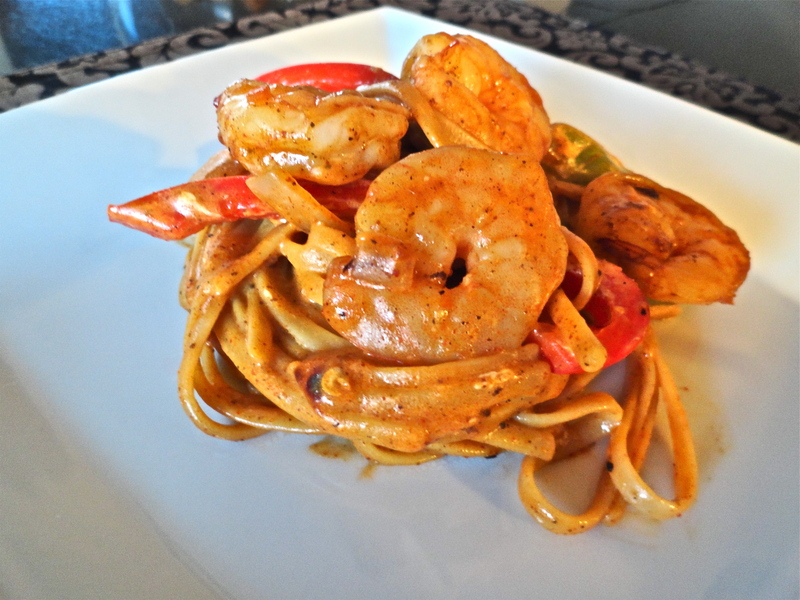 Shrimp Fajita Pasta: This is another one that made my list. Probably my favorite of the year, plus the picture rocks! Sausage and Pumpkin Pasta: This was one that I was surprised he liked so much, but I’m glad to hear it. It’s curiously delicious! Asian Chicken Lettuce Wraps: These are always so good, I double the recipe every time so we have a few days of leftovers. Another overlap from my list. 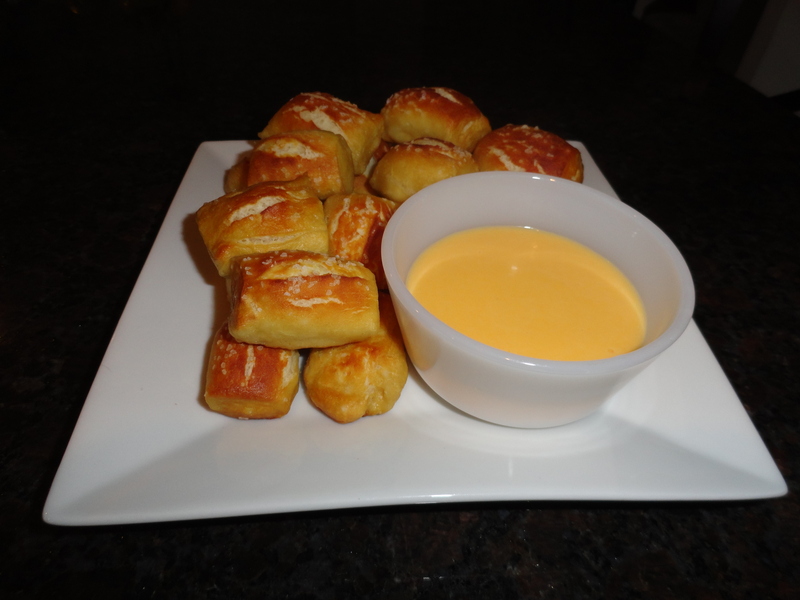 Pretzel Bites with Creamy Cheese Sauce: These are perfect for a party, but it’s probably best if you have a mini slow cooker to keep the cheese sauce warm (over the stove on simmer would work well too). I definitely need to make these again to get a better picture! While he narrowed down his top 5, he also made a list of his other favorites throughout the year. 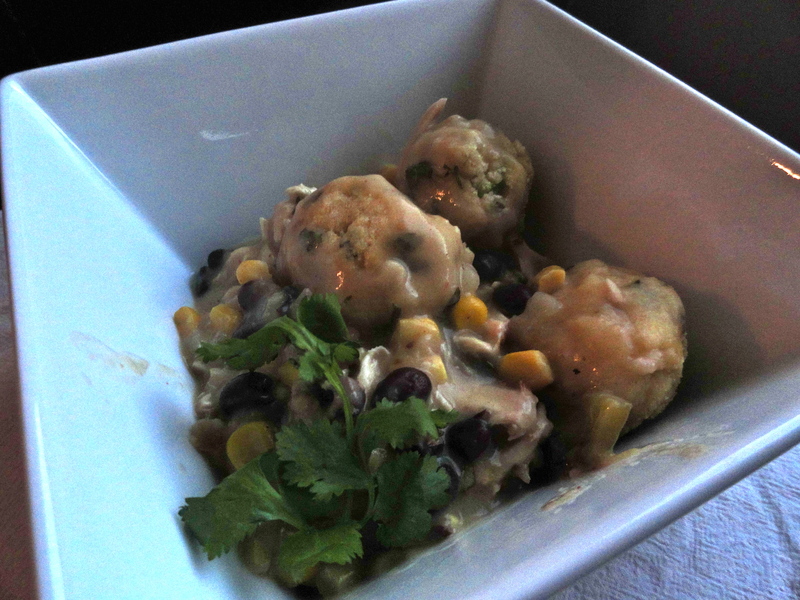 Salsa Verde Chicken ‘n’ Dumplings: This was so delicious, but very difficult to take a good picture. I loved the salsa verde in this recipe, too! 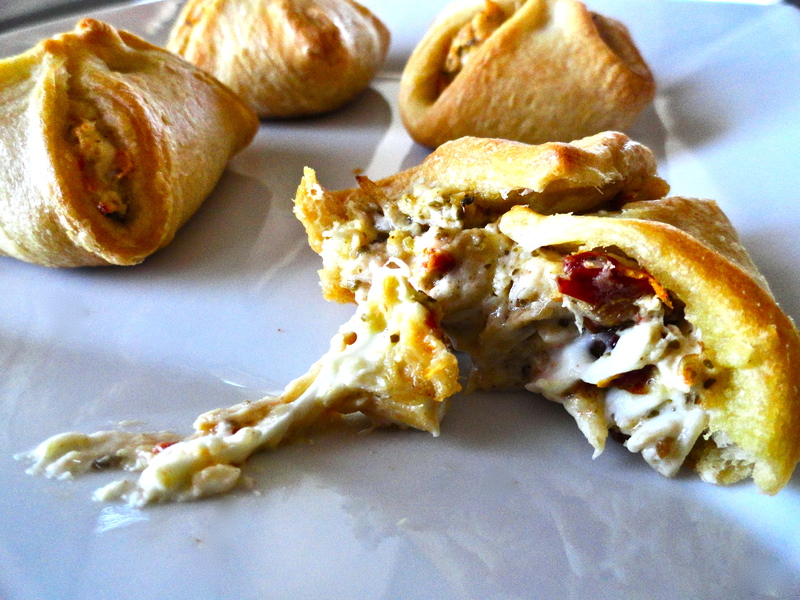 Pesto Chicken Pockets: These are so cute and super easy to make for a party appetizer. Make extra, because they’ll go fast! Bagels: I made two types of bagels (Jalapeno and Onion, Rosemary and Olive Oil) this year, and was surprised that they both turned out wonderful! I’m really catching on to this baking thing! Penne Rosa with Shrimp: This was a blogger’s choice recipe swap recipe, and I think I picked a great one! Beef Enchiladas with Roasted Corn: I added the roasted corn in these just to use up corn in my fridge, but it turned out to be a wonderful addition. 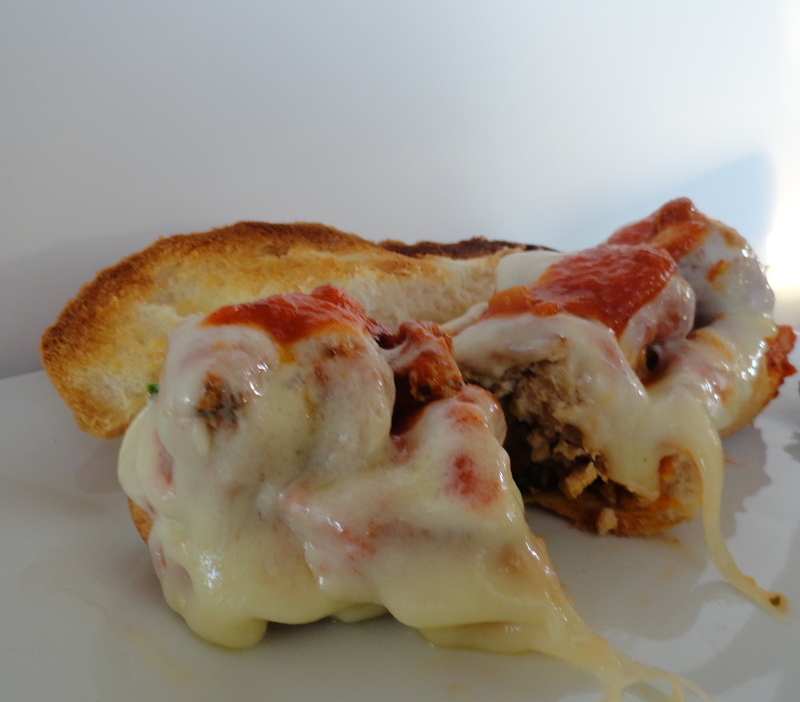 Add in my homemade enchilada sauce and it was an instant hit! Taco Pizza: Nate said he could eat this until he throws up. Enough said. Santa Fe Chicken Salad: This salad was so awesome, it was better than one you’d get in a restaurant…of course! Looking forward to making it more this upcoming summer on my new deck! Bacon Wrapped Jalapeno Poppers: The sun-dried tomatoes in the filling were a risk, but it paid off. These were a huge hit at our drink tasting party! Pesto Chicken Pinwheels: These are so simple and everyone loves them. A great appetizer to bring to a party. I brought them to my work Christmas party this year and they disappeared in an instant. Basil Pesto Turkey Burgers with Sun-Dried Tomatoes: Another great matchup of basil pesto and sun-dried tomatoes. What could be better? 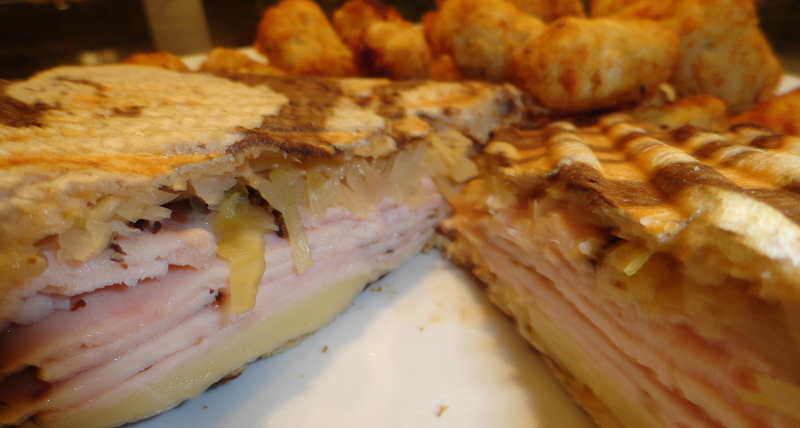 Southwest Chicken and Swiss Panini: I just happened to throw a bunch of ingredients in my fridge together to make these paninis, and this was one of my most pinned posts of the year. Crazy! Red Velvet Cookie Sandwiches: These were delicious and much like the cake, but in cookie form. A bit sticky, but so good! 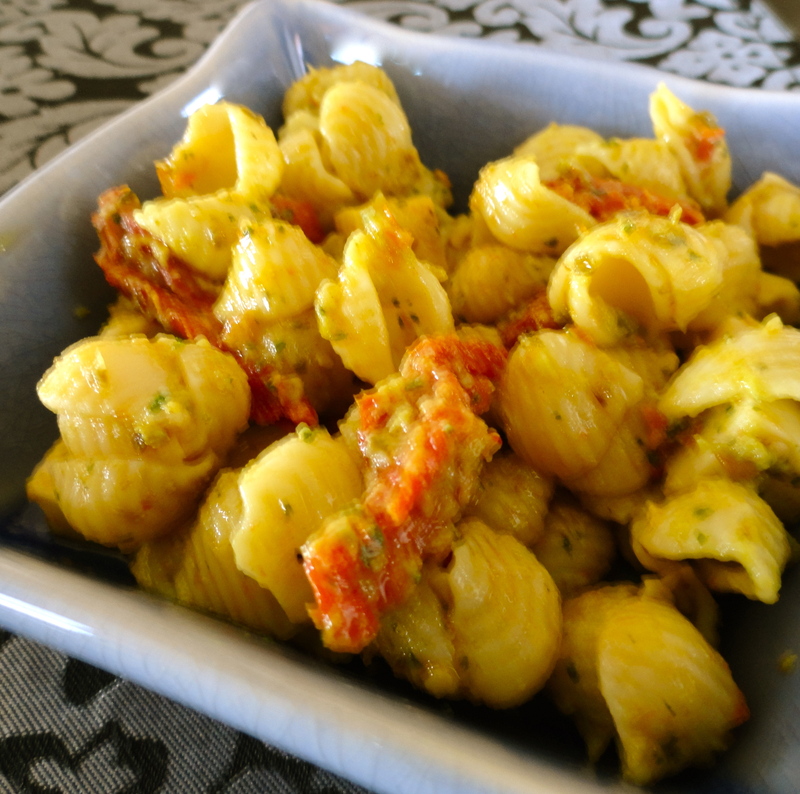 Green Chili, Tomatillo and Avocado Pasta Salad: I happened to have the sauce leftover from a grilled chicken dish I made earlier in the week, so I threw it over some pasta, added some sun-dried tomatoes and mozzarella cubes. So yummy! Pepperoni Pizza Puffs: Another great appetizer to bring to a party. These are so simple, and who doesn’t love pepperoni pizza? Chicken Tikka Masala: This is a horrible picture, and honestly, it looks like someone threw up over a bed of rice. But guess what? They didn’t. 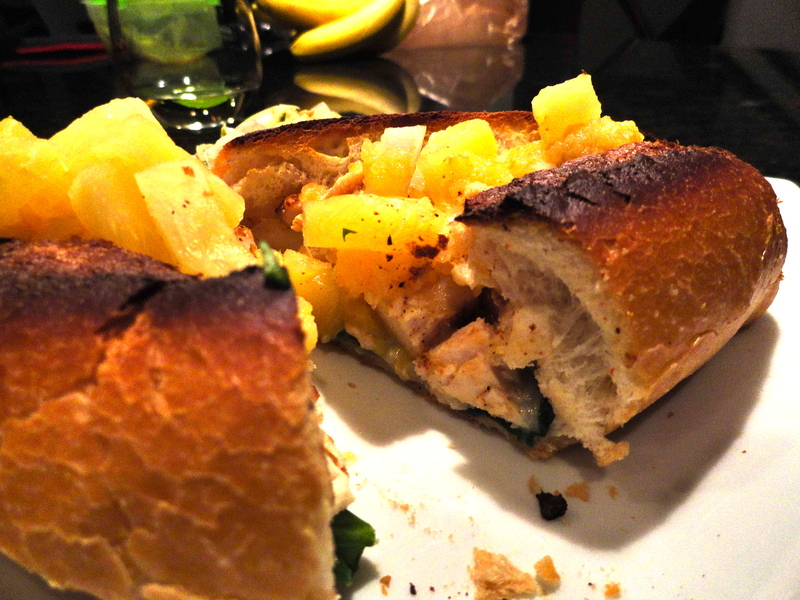 I need to remake this and get a better picture so it at least looks appetizing, because it is! Which recipes did you like the best from my first year of blogging? 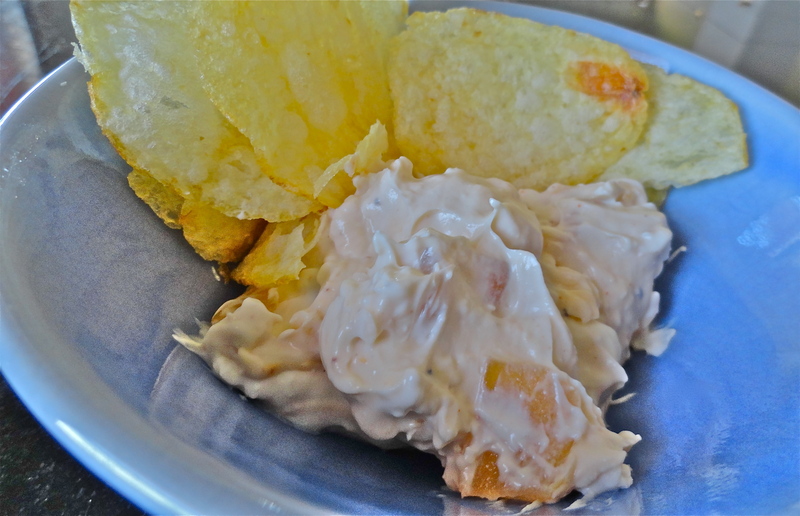 Caramelized Onion Dip: I’m not sure I could count the number of times I’ve made this in the last 6 months or so (not the year only because the original post was in June). I’ve made it for ladies night, camping trips, casual friends get togethers, birthday celebrations and more. It’s always a big hit and so simple to make! Honey Mustard Chicken Skewers with a Kick: These skewers are an easy way to dress up grilled chicken. They had so much flavor; I can’t wait to make them next summer on our new deck! Cinnamon Swirl English Muffin Bread with Maple Walnuts: When I successfully made a plain English muffin bread, I couldn’t wait to make something a bit more fun. 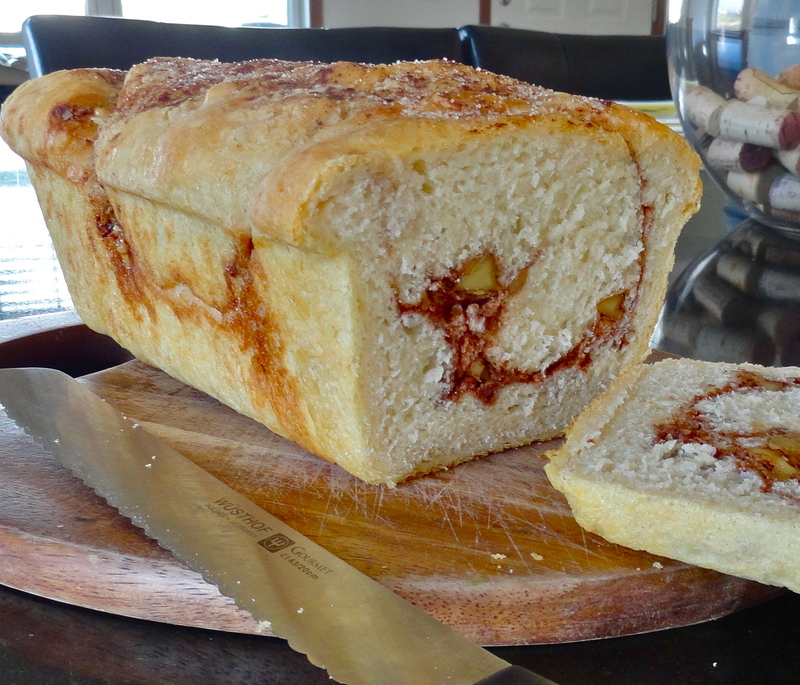 Growing up, it was a treat when my dad would buy cinnamon swirl English muffin bread, so I made this loaf especially for him. Pumpkin Scones with Maple Glaze: I never would have tried this recipe had it not been assigned to me for a recipe swap, but thank God I did. 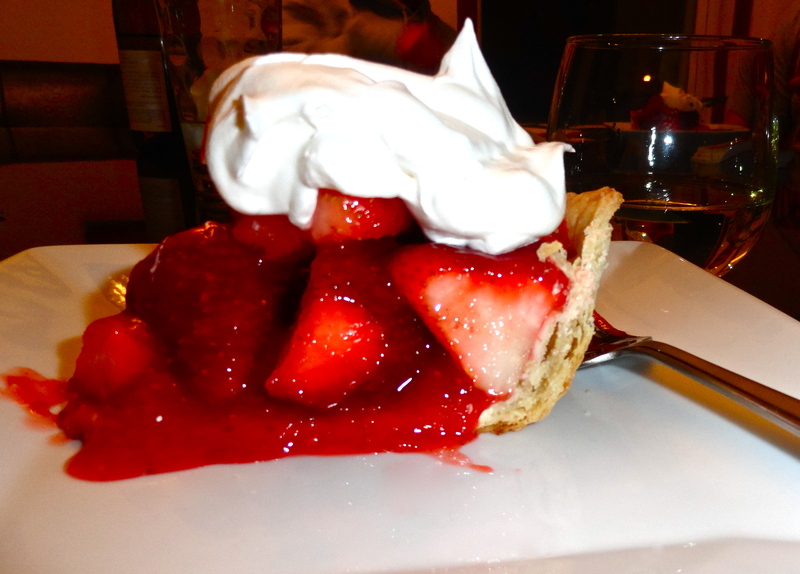 They were so good – I’ve made three batches of them so far this fall/winter. 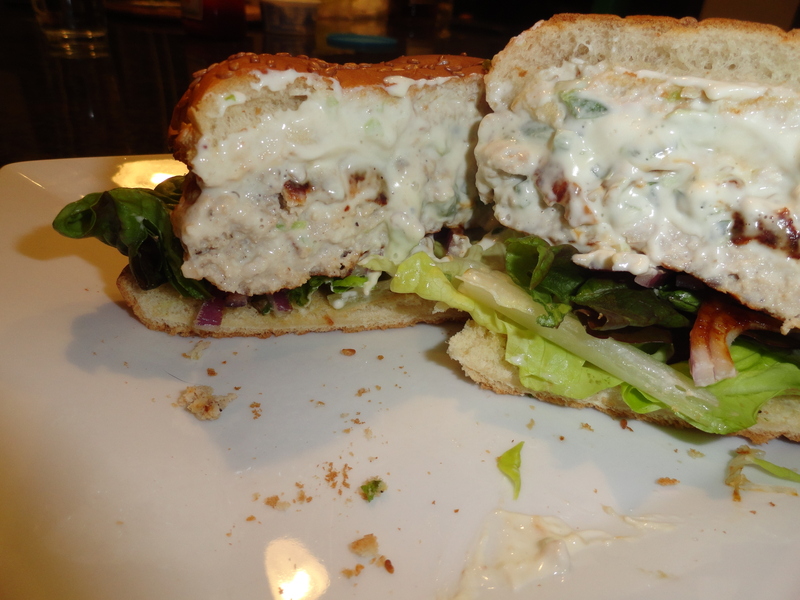 Cream Cheese and Jalapeno Stuffed Turkey Burgers: This was one of my very first posts, so please forgive the picture. Still one of my all time favorite turkey burgers! Pulled Hawaiian Chicken Sandwiches: Sweet and spicy make a perfect combination for these sandwiches. I’ve tried baking and using the slow cooker, but its definitely not as good as grilling. You must grill the chicken! 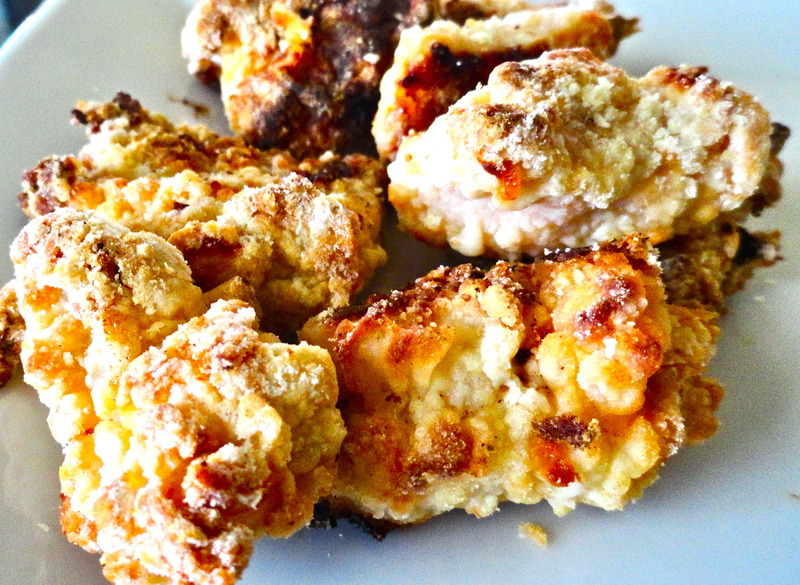 Mom’s Chicken Nuggets: These are definitely in the top 5. Mom’s are still the best, but I think mine wouldn’t be shunned by the family. There’d still be fights over the leftovers! Asian Chicken Lettuce Wraps: These are so delicious and wonderful for a pot luck – just make sure people can sit down to eat them because they can get messy. Buffalo Chicken Wonton Cups: I used to wrap these up and make actual wontons, but the cups are a much classier presentation (and easier!). Try them both ways to see what you like best! Neiman Marcus Chocolate Chip Cookie: Probably my new favorite cookie recipe. The secret ingredient really perks up these cookies! Japanese-Glazed Pan Roasted Duck Breasts: I can’t wait to get more duck breasts from my dad and try more recipes, but this one was out of this world amaz-balls! Shrimp Fajita Pasta: Definitely in the top 5 of all recipes that I’ve made. Nate and I both absolutely LOVE this pasta. I would change absolutely nothing and eat it every day if I could. Taco Pizza: I couldn’t believe that I was making pizza dough from scratch! Not only that, but I was grilling it. Wow! This was by far the best pizza I made, and to quote Nate, “I could eat it until I throw up.” If that’s not saying something, I’m not sure what would be? 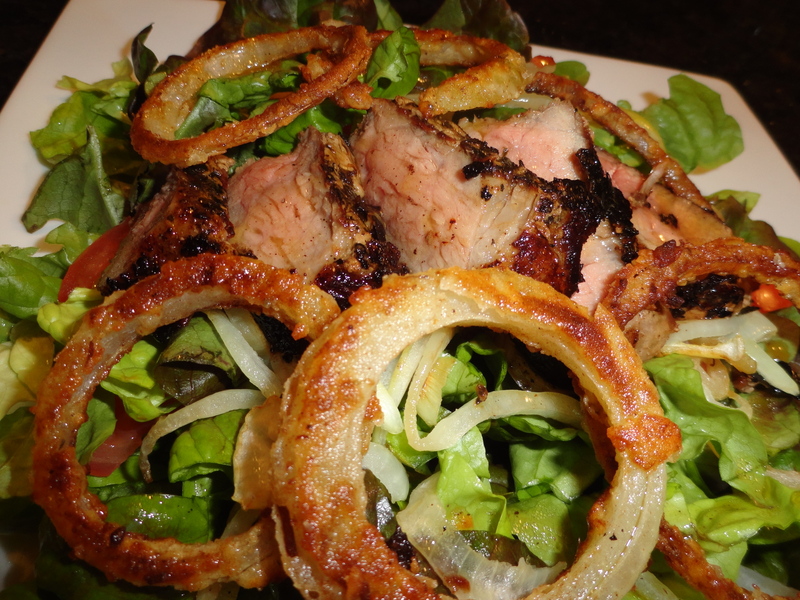 Grilled Hoisin-Glazed Pork Tenderloin: This was my first pork tenderloin and I was terrified of over cooking it. Thankfully, Nate was the grill master, so it was his job – though I said when it was time to come off the grill. 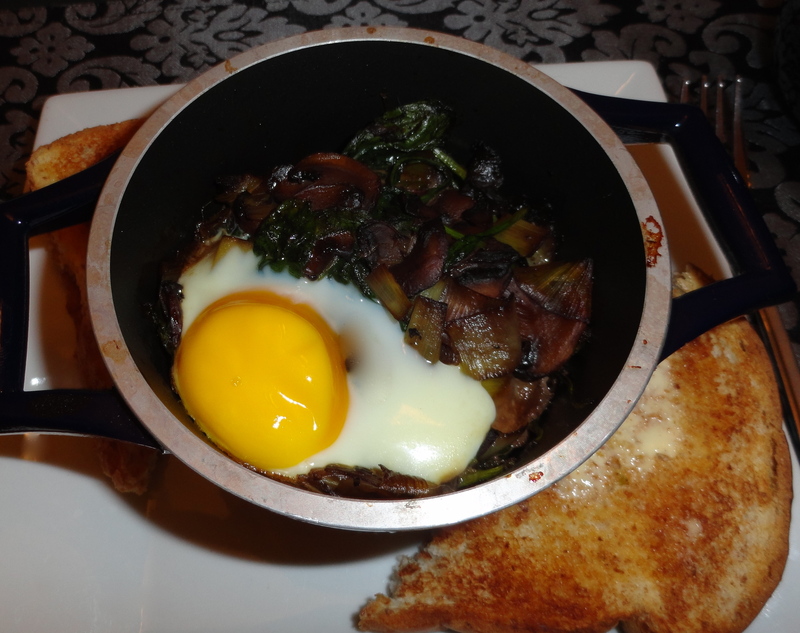 So tender and so flavorful! Chili Lime Shrimp Salad: This was a fantastic summer salad! I plan to have the ingredients on hand at all times next summer. Chicken would work great, too! 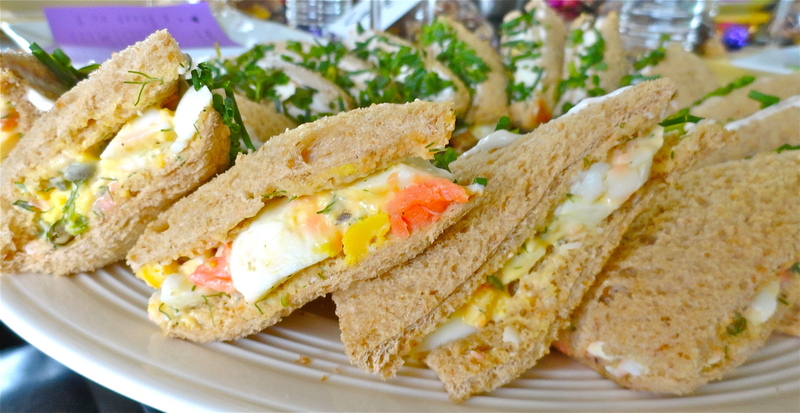 Smoked Salmon and Dill Egg Salad Sandwiches: I made these for the first time a few years back for my best friend’s bridal shower – for over 50 guests!! I was so worried with so many guests, but thought these sounded pretty classy (and EASY), so I went for it. They are great little snacks for any gathering. I served them again after my Ladies Wine Exchange, as we needed to get a little substance in our stomachs after all the wine tasting! Salt and Vinegar Potatoes: We don’t eat a lot of potatoes, but when I don’t have another side, these are a simple standby. The potatoes really hold on to the vinegar flavor and pack a punch! Fennel Whipped Potatoes: Even though the first time wasn’t perfect, these still made the list because they were SO good. Perfectly light and fluffy. Quickles: I couldn’t even begin to tell you how many times I made these over the summer. 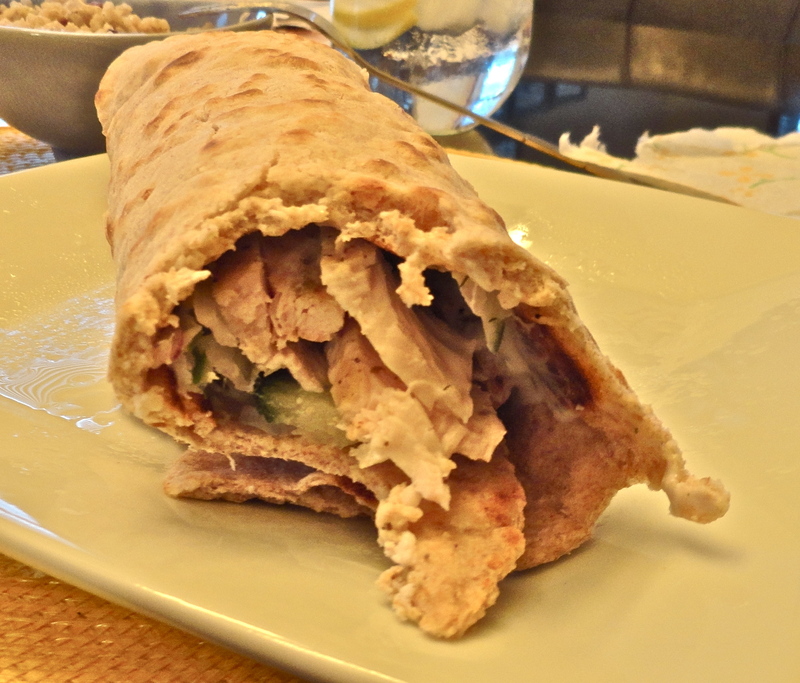 We were on cucumber overload, so quickles were great. Also great, they last for a few weeks in the fridge because of the vinegar (the longer they sit, the better they get). Awesome! Crispy Baked Zucchini Fries: I loved these, even left over, which some people said they were even better the second time. The panko makes them so crisp, even if you are reheating them. I prefer the ranch dipping sauce, but marinara is great too! These were my favorite. Stay tuned for what Nate thought was great in 2012! What were some of your favorite recipes this year? We’ve (I’ve) had a busy last few weeks! I’m sure you haven’t forgotten that I announced our engagement not too long ago, and we’ve set a date! Sorry, but if you haven’t received yours, that means you aren’t invited 😦 But don’t take it too personally; we are only inviting 13 people to join us for our nuptials in Sonoma, CA. I just wanted to share our adorable Save the Dates. We used wine from Kunde, the family estate that the ceremony will be held at in Sonoma. What are some cute ideas you’ve seen for save the dates?